Together these three musicians from different corners of the planet have produced collection of recordings that evoke a unity of spirit and a global sound. 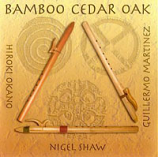 The music moves between gentle flute pieces performed on three Native American flutes, traditional Buddhist and Native American prayers, and powerful drumming chants. 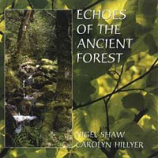 Echoes of the Ancient Forest has become one of Carolyn and Nigel's best selling albums and is recommended by many practitioners for massage, healing, relaxation and inspiration. The roots of this album are natural recordings of forest sounds and birdsong from surviving ancient woodland on Dartmoor. Gentle improvisations of wooden flutes, traditional whistles, keyboard and voice are blended to evoke the atmosphere and delicate beauty of our lost forest.